Starts grinding when tilted - no need to press on any button! Red Gravity Salt and Pepper Grinder Set How to season with one hand busy stirring the pot? Every chef knows the dilemma. With the Kalorik Gravity salt and pepper grinders it doesn't get any easier: tilt the grinders over the pot and it does it all by itself. A ball inside the grinder sets the electric grinder in motion once it's angled - all you have to do is pick whether you want pepper or salt. The grinders works for other spices as well. 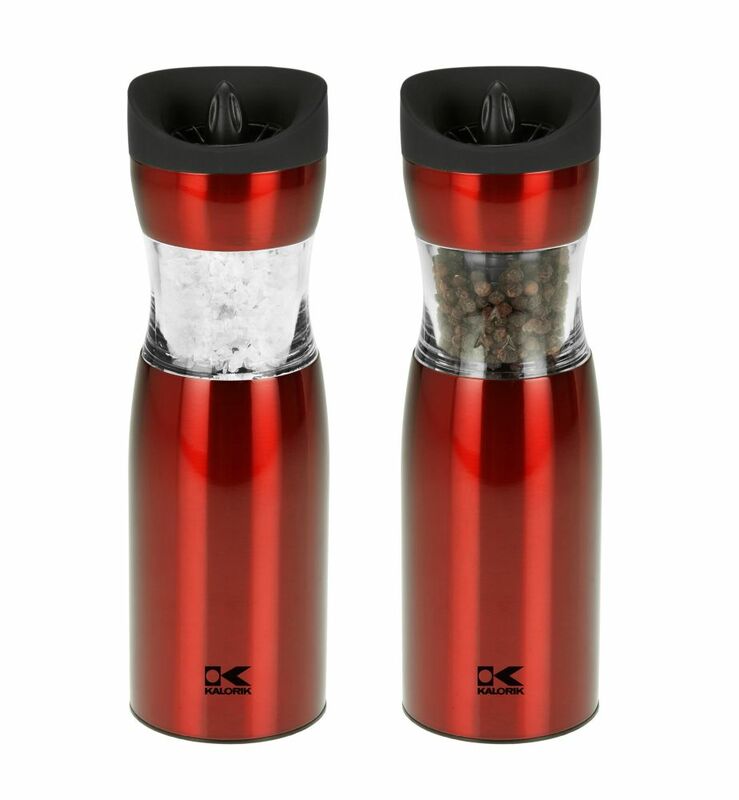 Both, the salt and the pepper grinders are adjustable in fineness and they're easily refilled by lifting the grinder's cap. Stainless Steel finish. Red Gravity Salt and Pepper Grinder Set is rated 4.6 out of 5 by 5. Rated 4 out of 5 by JJmonday from This model works well. They are a nice design and quality. They have a little led light and turn ... This model works well. They are a nice design and quality. They have a little led light and turn on and off just by tilting which is what I was looking for for my mother who has arthritis in her hands and likes to cook. These fit our needs. But as with most of these grinders the motor is pretty much maxed out while grinding are a little noisy and do not hold enough salt or pepper in my opinion . Rated 5 out of 5 by Kkrisentmobf from Kalorik Grinder Set Perfect look, perfect match, and work flawlessly !